The overwhelming support for the candidacy of Ricky Vargas, president of the Amateur Boxing Alliance of the Philippines or ABAP, against 82 year old Jose “Peping” Cojuangco who is seeking an unprecedented fourth term as Philippine Olympic Committee president and the continuing revelations of blatant violations of the law by clearly identified lackeys of Cojuangco has made the position of POC-Comelec chairman Frank Elizalde untenable and a reflection of his utter lack of decency and integrity in disqualifying Vargas. Elizalde, a known partner of Cojuangco who unabashedly lobbied for “Peping’s” daughter, Mikee Cojuangco Jaworski as his successor, demonstrates the closeness of the two although, quite honestly we have great respect for Mikee, the only Asian Games gold medallist in the Beijing Games, who is articulate, understands sports and the needs of our athletes. However, Cojuangco’s influence over Elizalde and the IOC officials support for “Peping’s” daughter did raise questions of propriety. Ranged against this Elizalde’ s disqualification of Vargas on the flimsy excuse that he had failed to attend fifty percent of General Assembly meetings which was a self-serving rule instituted by Cojuangco’s henchmen was both illegal and improper in the face of the demands of the public for a change in the sporting leadership which has presided over a series of disasters even in the lowest level competition – the Southeast Asian Games. “Peping” and his golfing buddy and former Philippine Sports Commission chairman Richie Garcia who conspired to hoard P1.2 billion in Pagcor contributions meant for the training of our athletes, upgrading of equipment, proper nutrition and training stints abroad in order to construct a training center in Clark Field in complete violation of the law governing Pagcor contributions to the PSC for our athletes. Those funds were intended to build a sports center and in failing to spend the money on our athletes, their training programs, nutrition etc., Garcia and the PSC effectively broke the law. Another scandal involving a favoured National Sports Association close to Cojuangco has just been unearthed. The Securities and Exchange Commission has issued a statement that the Philippine Weightlifting Association whose papers were revoked since 2003 was still given assistance even if they failed to submit financial reports which is a requirement for funding! 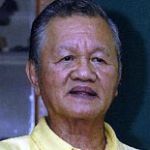 We recall how another Cojuangco henchman, Mark Joseph of the Philippine Swimming Association, received P40 million directly from Pagcor under its former chairman Ephrain Genuino which was a gross violation of the law and allegedly ploughed P20 million back into the Trace Swimming facility reportedly owned by Genuino. A congressional probe didn’t prosper under the presidency of PNoy who was the uncle of “Peping. Cojuangco has a fight on his hands against Vargas’ spokesman, the articulate and brilliant youthful lawyer and former Philippine Basketball Association Commissioner Chito Salud. Elizalde disqualified Vargas and cycling chief Bembol Tolentino who sought the position of POC chairman for being “non-active members”. Vargas, for one, has been genuinely active in ABAP while his executive director Ed Picson attended the general assembly gatherings as his representative. But as Salud so correctly pointed out, active membership is not physical appearance. As Salud said the interpretation is simply arbitrary and simplistic. Vargas was also clearly denied “due process” before issuing a ruling that said Salud was disqualified. Does Elizalde indeed have the right to disqualify a candidate without even conducting a hearing and with no objection from a general assembly member? With the IOC rules requiring candidates for the IOC presidency to be no older than 70 years it would naturally follow that a National Federation president should be within the age limit. But Cojuangco and his henchmen altered the rules to enable the 82 year old “Peping” to run. The IOC rules clearly state “the age limit fixed is 70 years old, except for members co-opted between 1966 and 1999 for who the age limit is 80”. “Peping” Cojuangco didn’t meet any of the criteria and besides, he is 82. This is a travesty that the International Olympic Committee must act to remedy, right away.